CCG’s MINI PHOENIX® PLUS Odor Control System is an integrated 3-stage system which consists of a 1st stage carbon unit and our proven patented PHOENIX® technology for the 2nd and 3rd stages. 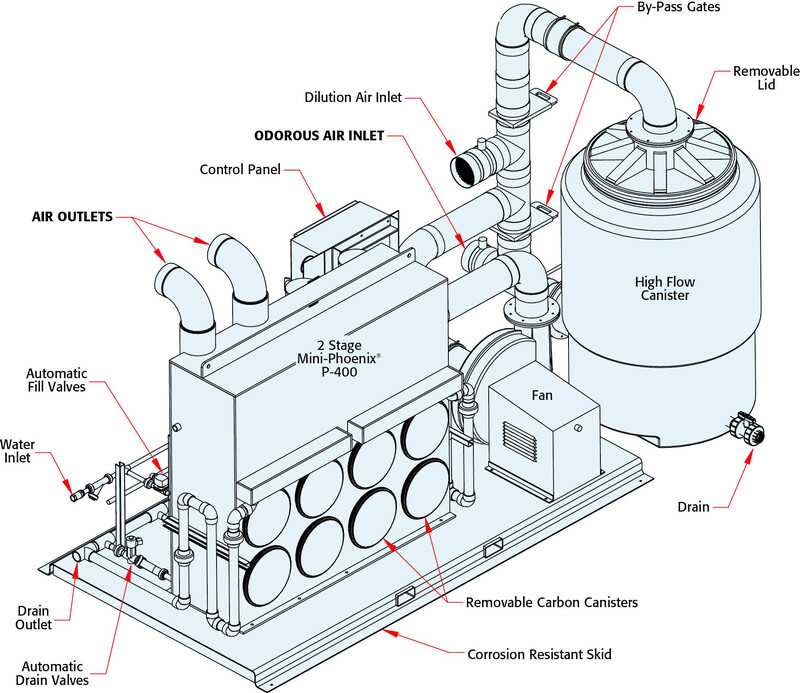 The 1st stage High Flow HF carbon unit utilizes a bed of high activity activated carbon for the removal of reduced sulfur compounds (RSC) and organics. The 2nd and 3rd stages employ the state-of-the-art PHOENIX® technology which is simply the most effective means of removing airborne H2S, the most prevalent odorous compound present in wastewater treatment. This combination produces a complete odor control system that can continuously remove RSC, organics, and up to 50 ppm of H2S with 99% time-weighted average efficiency which will result in the best odor reduction possible. The HF carbon canister has a removable top and ductwork designed/engineered to facilitate quick and easy changeout of the HF carbon bed. This built-in bypass of the 1st stage carbon unit allows for the continuous treatment of H2S even while the HF carbon bed is being replaced. Using proprietary computer-based adsorption models, CCG can also predict the bed life for the 1st stage carbon unit based on stream composition and conditions provided to optimize system size, design, and operating cost estimates. The Mini PHOENIX® PLUS is designed for 400 and 800 CFM air flow rates. With its small and flexible footprint design, it is ideally suited for municipal wastewater collection system applications such as pump stations and lift stations, as well as some wastewater treatment plant processes such as headworks, grit tanks, and dewatering applications. For applications other than continuous operation at the design air flow rate, contact the CCG Team for review and recommendation.